Glass Magic Colorado offers a revolutionary and cost-effective solution for many types of scratched glass – Auto Glass being the lone exception that we do not repair. Glass Magic Colorado can provide nearly flawless glass scratch repairs, generally for between 25% – 75% the cost of glass replacement. Commercial storefront glass that’s been vandalized with deep scratches is just plain ugly! At Glass Magic Colorado you may not need to replace that expensive plate glass that vandals have seemingly ruined. Our proprietary scratch removal technology combined with the patient and skilled scratch removal methodology results in crystal-clear glass at around half the cost of glass replacement. 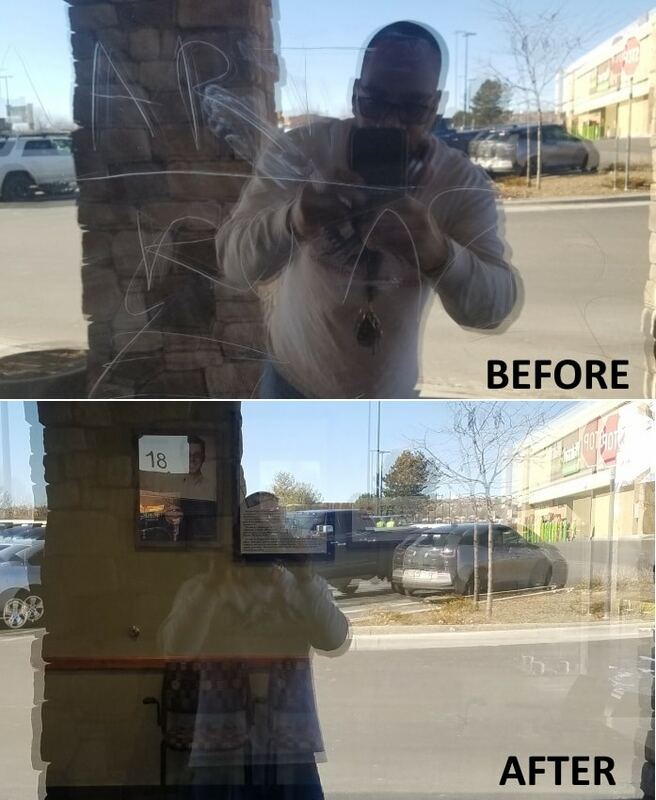 Glass Magic Colorado comes to your business location and quickly and efficiently removes those ugly glass scratches – saving you money in the process! With Glass Magic Colorado, we can usually remove those scratches at a fraction of the cost of glass replacement. After a custom price estimate, we come to your home to do the repairs. Clean up is completed at the end of any work period and upon completion of the repair. Your formerly scratched glass will be clear and will look as good as new!